gentle curve of roof. Alight. 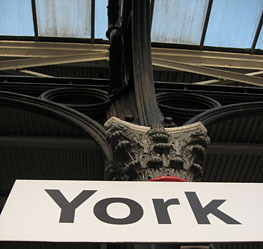 ‘York Station’ – an attempt at haiku. Shorter than my usual offerings. Never written one before. Everyone should try it. If you’d like to ‘have a go at haiku’ there’s even a handy online tool to check the syllable count. If you’re inspired by York, or have a particular memory of York, and succeed in writing a York haiku, it would be lovely if you felt like sharing it below, via the comments form. Or email it if you have a photo you’d like it to be attached to. By Lisa @YorkStories • 18 July 2012 Miscellany, Railways To link to this page's proper location please use the > permalink.